Note: This application is to be used for persons requesting permission to deviate from the Borough's regulations, for which there are no other forms. Examples include, but are not limited to, Temporary No Parking Requests: Permission for placement of dumpster or other similar item on Snow Emergency Route between December 1st and March 31st; Permission to encroach onto public sidewalks; etc. Temporary No Parking Requests are dispositioned by the Mayor: Code Sec. 252-3A (this includes requests for placing a dumpster on street, except for Snow Emergency routes, from Dec. 1st through March 31st. 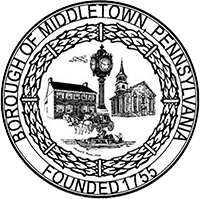 Submit request forms to: Borough o[Middletown 60 W. Emaus St. Middletown, PA 17057, Attn: Borough Secretary. Borough Staff - dispositioned forms are sent to the Borough Secretary for record purposes. Download and print out the special application form.